The combination of dairy and berry flavors is one of the best in desserts. Make cheese and berry stuffing, enrich its delicate creamy taste, make a thin cake layers, and the success of your dessert is provided. Prepare shortbread crust: soften 100 grams of butter, put in a large bowl, add 50 grams of sugar, half a teaspoon of vanilla sugar. Grind into crumbs, add 200 grams of sifted flour, mix well. Take an egg, separate the yolk from the white, add yolk to the dough and mix to obtain a homogeneous mass. Preheat the oven to 180oC. Take a baking pan, better split. Cover the bottom with parchment paper or grease with oil, put into it the dough and bake for 20 minutes. Prepare sponge cake: take 3 eggs, separate the yolks from the whites. Mash the yolks with 100 grams of sugar, add 3 tablespoons of warm water and bring the mass to a homogeneous condition. Mix in separate bowl 2 tablespoons cocoa powder, 3 tablespoons of starch and 100 grams of ground hazelnuts. Connect both mixtures. Whip the egg whites until a solid foam. Add into the yolk-nut mass, mix gently, put in a greased form and bake for 15-20 minutes. 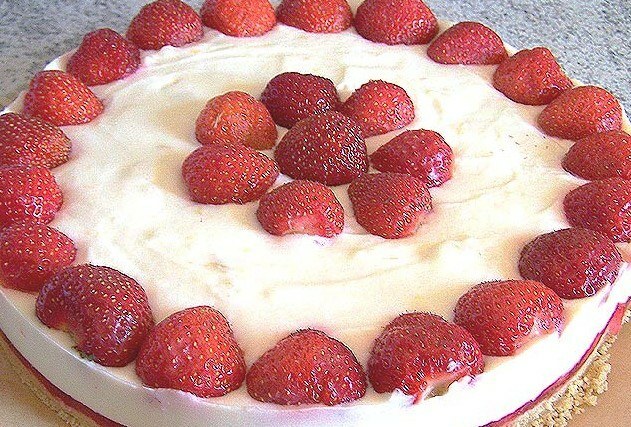 Prepare a thick jam of 600 grams of strawberries and 4 tablespoons sugar Mix the cheese with sugar and vanilla sugar, grate in the zest of lemon and orange, add to the cream cheese. Stir and add 1 tablespoon of jam. Pour 20 grams of gelatin in cold water, give to swell, prepare the water bath and dissolve in it gelatin. Then cool and add to cottage cheese. Whip the chilled cream, add the cheese, stir. Take a baking dish with high sides (preferably detachable), put down a sand layer, put on his jam, then the sponge cake. On it pour the curd mass, gently tap the form on the table, then the ground will settle. Put the cake in the fridge for 8-12 hours, then remove and garnish with strawberries.